Paul Reed Smith is looking to expand it’s Acoustic Guitars with the new SE Acoustic Guitars series. PRS fans rejoice, Paul Reed Smith is intending to expand his guitar company’s line of acoustic guitars with the SE Acoustic Guitars series. Quoting PRS: “The Paul Reed Smith Guitars SE Acoustic line strives to provide the finest instruments in its price point.” With the reputation of PRS, there is a good chance that they will honor their words. The first model to come out of the SE Acoustic line is the PRS SE Angelus. As expected, it is made with quality parts, including a solid spruce top, Bone nut and Saddle, Solid back and a set of exclusively designed PRS SE Tuners. The SE Angelus have the same proprietary bracing design and construction elements as PRS Maryland-made acoustics. It oozes with the same PRS quality as hallmarked by trademark bird inlays and the traditional PRS headstock design. The SE Angelus will be come out in both Standard and Custom package. 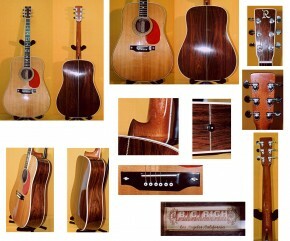 The Standard package will have mahogany sides and a solid mahogany back with rosewood fretboard and bridge. The Custom package on the other hand will have rosewood sides, a solid rosewood back and special ebony fretboard and bridge. The first batch of PRS SE acoustic guitar will be purely acoustic, and will only be available in limited quantities. The next batch will have built in pickups and will be avialable around the early part of 2012.